This is a textbook about classical elementary number theory and elliptic curves. 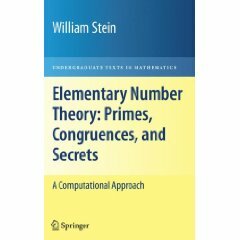 The first part discusses elementary topics such as primes, factorization, continued fractions, and quadratic forms, in the context of cryptography, computation, and deep open research problems. The second part is about elliptic curves, their applications to algorithmic problems, and their connections with problems in number theory such as Fermats Last Theorem, the Congruent Number Problem, and the Conjecture of Birch and Swinnerton-Dyer. The intended audience of this book is an undergraduate with some familiarity with basic abstract algebra, e.g. rings, fields, and finite abelian groups. Also, see github for the book's LaTeX source code and newer versions. Of course, I would greatly appreciate it if you support the book by buying it.